Two refreshing solo painting shows up now in adjacent galleries have much in common, but wander down wildly different paths. Mary Bucci McCoy, at Kingston Gallery, and Jered Sprecher, at Steven Zevitas Gallery, make mostly small, mostly abstract works. Bucci McCoy’s delicately toned and textured paintings read like haiku: swift, elusive, ripe. Sprecher’s much denser, hotter-toned works display an exuberant virtuosity: He cuts up, sorts, and juggles forms; he layers veils of pigment. Small as his works are (the paintings on linen are 11-by-8 inches), they are deep, whereas Bucci McCoy’s are more wide open. Sprecher doesn’t start abstract: He uses a photo of pigeons nesting along a cliff as source material. You can see the birds in some larger paintings on paper at the back of the gallery. He painted each methodically from left to right, from top to bottom. This system puts equal weight on every mark, so although these works are pictorial, the picture seems incidental to the accrual of small dabs and swipes. They swing deliciously from image to abstraction. For the smaller paintings, the artist chopped up photocopies of his pigeon photo and made collages, which he re-created in oil paint. The birds can be discerned in only one of these works, “Pigeons,” in which we see a plump green silhouette, with the fluff of the wing feathers accentuated, but again the image seems incidental to the spark and flow of abstract painterly fireworks: down-rushing smears of gray and yellow, a narrow curtain of hot pink on one side. Knowing the birds are there, if only in fragments, you might start to look for them. Is that the curve of a breast in “Invention of the Chair”? And maybe the stony face of the cliff along the bottom? But this painting hinges on the thick, flat bars crossing one another, in black with great gaps of orange, over a changeable orange and red ground. The violently colliding bars have heft, but they vanish. There’s a broad passage of dun in the background at the top, a bland banner. Sky blue brushes lightly over the surface. 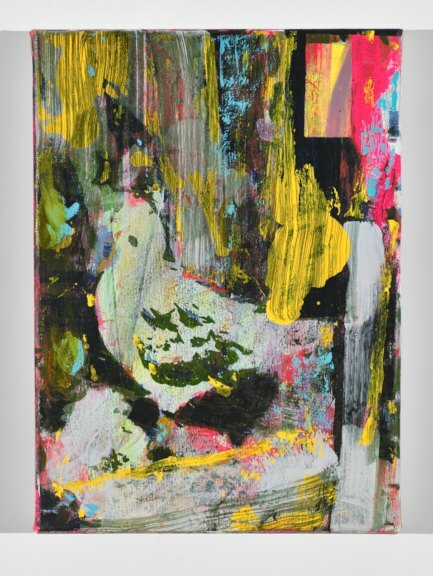 Sprecher plays tricks with space and surface; he makes bold marks and dainty ones. There’s so much going on in a relatively small space, it’s as if he’s deftly answering in paint the question of how many angels can dance on the head of a pin.